Description: The Bible basics of serving the Lord are the foundation stones upon which the entire Christian life is built. 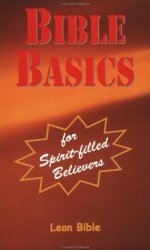 It is crucial that these basics be a part of every believer's life. Bible Basics for Spirit-filled Believers is a Scriptural Spirit-filled study of the twelve most important things every believer should know and practice in their Christian life; in order to live the overcoming life that the Bible promises believers. Introduction by the author: This study guide on Bible basics is intended to be just that. It is not a comprehensive study dealing with every thing the believer needs to know in his or her Christian walk. The purpose of this guide is to deal with the essentials that are needed most. In this guide you will notice that very little comment is given. The Bible is a living book, and it is my intention to let the Bible speak for itself. This guide is written so that it can be used many different ways: as a personal Bible study; a group Bible study; or a Bible study taught by the Pastor or leaders in the local church. This Bible study is as the title suggest Spirit-filled. That is, the Word of God is inspired by the Holy Spirit, and it is also accepted that based on the teaching of the Bible, that the Spirit-filled experience is available for believing Christians today. While this guide emphasizes the power of the Holy Spirit through out, it does not venture into fringe areas or experiences which are not found within the pages of the Bible. Now a little bit about the layout of this guide. The guide is laid out in outline form. By reading the titles of each division and then the subtitles as well as the accompanying Scripture, a plain and simply Bible lesson can be taught and understood. The questions that are given after each verse of Scripture are for extra emphasis and meditation of the point that the Scripture has made. No thought or statement is made that is not clearly a teaching of the particular Scripture cited. At the conclusion of each chapter is a box entitled assignments. These assignments are to encourage you in the following ways: To read the entire New Testament through in the time that it takes to complete this guide. Twelve weeks is suggested. A memory verse is given which embodies the greatest overall thought of the chapter just studied. In the back of the book you will find "cut out" memory verses to aid you in memorizing the Scriptures. A suggestion as to applying the word into your life each day is given in the Speak the Word section. Also, suggestions for applying the lessons in your prayer time are given. In addition to the assignments at the end of each chapter, you will also find a Journal or Notes sheet. This space is provided for note taking when you are in a class type setting. If you are studying this guide alone, you may use this as your personal journal to record any ideas and revelation you receive. In the back of the book you will find a progress sheet, which will help you keep track as you work your way through this study guide. It is the author?s prayer that this guide helps everyone who uses it to become more Christ-like in every way. Indeed, faithful commitment to the completion of this guide and to the principles which it teaches will accomplish this goal. Dimensions: (Length x Width x Height): 8.5" x 5.5" x .25"